So another year is coming to a close and it’s time to look how you can grow your business with creating a marketing plan for 2018. Before you start writing down ideas, take a few minutes to review what marketing channels you have used this year. Hopefully you spent your time and money wisely to earn a great return on investment. But marketing is so hard these days. What communication channel(s) should you use to have the greatest impact on your business? This is really the question when it comes to mastering marketing. What’s interesting here is that everyone, including marketing agencies, are telling you to invest solely in social media….Facebook fan pages, Twitter, Instagram pictures….and the list goes on and on. But all these channels are basically a pay-to-play situations. Facebook is the prime example of this situation. I mean why in the world do I have to pay to “boost” my business’s post? Every one of my fans should see what I share...right? You must make social posts though...it’s one of those necessary items to be on your marketing activities for 2018 and beyond. What you really need to consider and understand what channel works the best when the end goal is to actually reach your customers or audience. Not one social media channel has a 95% read rate like SMS (text messaging)….but yet we continue to invest time and money into them. Because we have been conditioned to think this way. 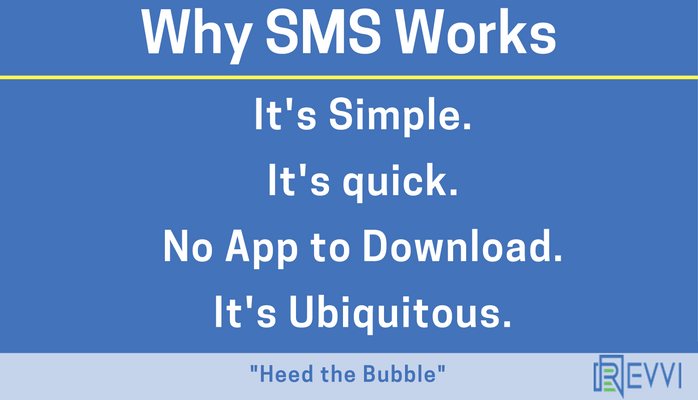 SMS turned 25 years old this year but yet it is the most underutilized communication channel in business. It’s time for you to make a change because we are now living in a messaging economy. These number are fantastic and crush all the other marketing channels….but how is this so? Now that you know how effective SMS is...it’s time to add it to your Marketing Plan for 2018. SMS will help your engagement across the board...increase retention rates, drive new business, and improve your customer service.